The young green bond market has grown fast. Since the market’s initial inception in 2007, the total yearly green bond issuance has expanded to $36.6 billion for 2014, triple that of 2013. As more corporate issuers entered the market, a bold prediction was made that there will be $100-billion worth of issues in 2015. But whether this prediction proves prescient or not, the value of outstanding green bonds in 2015 will remain a fraction of 1% of the global fixed-income market, now estimated at over $100 trillion. If that’s the case, what explains the disproportionate buzz surrounding green bonds? Well, one reason is the promise of going “green” at a time when climate change and environmental degradation have emerged as some of the major global challenges. Another is that business executives and financial journalists are forever on the lookout for the next big thing and they do not have an unlimited number of options. Green bonds “enable capital-raising and investment for new and existing projects with environmental benefits.” But they are a process rather than a product. That’s because the Green Bond Principles, their chief framework, are a set of voluntary guidelines about process. Market participants are divided on whether to develop standards to determine what is “green” and just how green it is. On one hand, standards could build credibility, but on the other, they could inhibit growth and innovation. In 2014, a group of nongovernmental organizations (NGOs) called for greater transparency and clearer definitions, stating that “Principles which allow banks to decide for themselves what is and isn’t ‘green’ do not exactly inspire confidence.” Indeed, conflicts of interest can arise if service providers in the green bond market assume more than one role, whether advising the issuer, offering a second-party review, providing third-party certification, verifying the use of proceeds, or performing other ex-post impact analysis. And it does not help that public disclosure of such information is not required. Green bonds are about what you do rather than who you are. That means companies in any sector can issue them. For example, a Thai oil company issued $92-million worth of green bonds in 2015 to be used for green projects. Earlier, in 2013, the energy giant EDF, known for its reliance on nuclear power, issued its first green bond for €1.4 billion to finance renewable energy initiatives. Opening green doors to gray companies comes with some degree of reputational risk for the market. Indeed, some of the prominent financial institutions in the green bond market have less-than-sterling reputations — for privatizing profits and socializing losses, for money laundering and LIBOR fixing, among many other troubling headlines still fresh in the public mind. Will they hold up their end? Time will tell. While proving additionality is difficult, simply ensuring that the proceeds are only used for the intended purpose and had the desired effect isn’t easy either. That’s because sometimes allocations are made to several projects, some of which may falter after the money has already been raised. In all cases, issuers have to answer questions about what actually happened and the effect it had, and this means plowing through complex issues and spending time and money on measuring and reporting. The cost of the additional work required for a green bond issue is absorbed by the issuer. So why are corporations issuing them? There are a number of rationales. Issuers may want to diversify their investor base, position themselves as leaders in the green space, communicate their values, or access economies available to repeat issuers since most of the costs are one-offs. And why are investors buying green bonds? Because they pay just like any comparable gray bond with the added promise of a green impact. Moreover some investment mandates lead investors to green bonds. To get a feel for opinion of investment professionals about green bonds, we asked CFA Institute Financial NewsBrief readers for their take on the principal challenge facing this market. 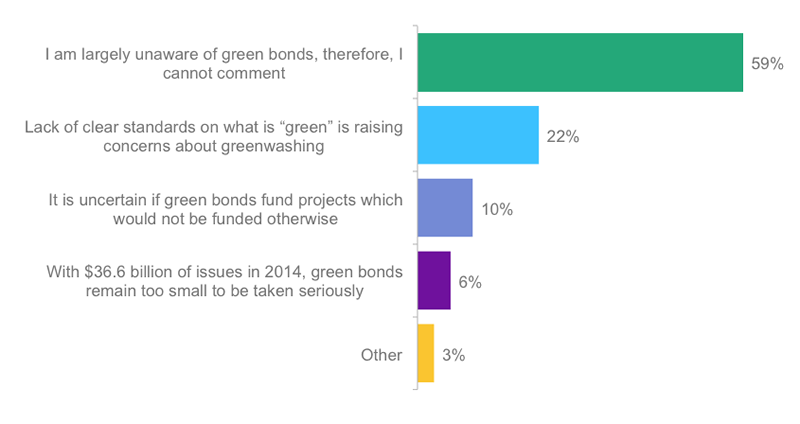 A clear majority, just about 60% of the 465 respondents, indicated that they are unaware of green bonds. Concerns about authenticity and additionality came in a distant second (22%) and third (10%), respectively. Poll: What’s the principal challenge facing the green bond market? While this poll is far from scientific, it does support the view that despite some generous coverage by the financial news media, green bonds remain a novelty that many haven’t heard of. The evolution of green bonds bears similarities to that of sukuk — or Islamic investment certificates, also known as Islamic bonds. Both green bonds and sukuk seem to rely more on process and an endorsement of their legitimacy rather than a defined economic or environmental substance. Sukuk have had a head start on green bonds but they also crossed the psychological threshold of $100-billion worth of issues for the first time relatively recently, in 2012. In both sukuk and green bonds, market participants seem keen to grow the market, perhaps indefinitely, and worry about authenticity later. Both markets are driven by a set of large issuers — sovereigns for sukuk and multilateral development banks for green bonds. Both attract a passionate following, and, let’s not forget, both generate hype that leads to great expectations (e.g., $100 billion issues in 2015) and misconceptions (e.g., green means lower return). And What about the 99%? Because green bonds will constitute less than 1% of the global fixed-income market even if the most optimistic growth predictions are realized, what about environmental, social, and governance (ESG) considerations in the mainstream fixed-income market? Would it be more effective if the resources applied to green bonds were directed towards integrating ESG considerations into the mainstream fixed-income market? After all, fixed-income investors also need to integrate ESG issues for a more complete risk assessment. A useful reminder is the case of the mining company Lonmin. After violent labor conflicts in Marikana, South Africa, in 2012, the company was forced to issue a warning regarding the servicing of its debt. Fixed-income investors are in a position to engage with issuers like Lonmin to address ESG concerns, reducing risk for the investors and improving the company’s ESG performance — that is, achieving the same intended outcomes as green bonds but without some of the complexity. Like other questions surrounding green bonds, “what about the 99%?” remains an ongoing debate. If you would like to know more about environmental, social, and governance (ESG) issues in sustainable, responsible, and impact (SRI) investing, please take this free eLearning course by CFA Institute: ESG-100: A Clear and Simple Introduction to ESG issues in Sustainable, Responsible, and Impact Investing. It is all about image. Offering green bonds and having a good record with ESG issues is good PR for a company. Making investment decisions based solely on those principles might not be the best allocation of capital. Missallocation of capital is a value investors best friend. Thanks for visiting the blog and sharing your views. The idea is that when a company improves its ESG performance, it reduces the ESG risks for investors. As for green bonds, I haven’t come across any evidence that they pay less than the comparable grey bonds or carry more risk, that is, no performance penalty for investors. These are green balloons with hot air and lots of paper work, but they will be kept in the air because accepting their flaws would (further) expose the geniuses working at the multilateral development banks. Thanks for visiting the blog. If I understand you correctly, you are cynical about green bonds and the rationale used by MDBs for developing this market. You are probably not alone in having such views. At the same time, there are those who are bullish about the different green bonds can make. I think the debate on green bonds is not settled yet. Its a new market, I’m willing to withhold judgement and wait for the body of evidence to accumulate. Pingback: Why Are Investors Paying Over Market For Green Bonds? Thanks for introducing the positives and negatives of green bonds! Insightful! Pingback: Green Bonds, Bringing Two Disparate Worlds Together | "ohmybio!"